Sitebuilder wont load, using a apple powerbook and firefox. Im using an apple powerbook, with the latest version of firefox! I have not yet made a website and have only completed the registration. I go to create a site and put what i want the name to be ect. Then it says sit back, it will only take a few moments or something. Then i see it load in the background but the loading page is still in the foreground. I try crossing the page but it just wants me to go through the whole process again but it just doesnt load again. It would be great if anyone could help. 1. Clear your browser's cache. This link has more information: Clear your browser's cache. 2. Check your privacy settings. You must accept cookies from Yola. Please click on this link to find instructions for accepting cookies with your browser: Accept cookies. Please let us know how this goes for you. The first link's broken.. and the second link has got the wrong steps, it gets to the third step and there isnt the checkbox it states you have to tick. "Incomplete. The article does not appear to provide enough information to help someone accomplish the task". Please comment on the discussion page as to whether it meets our criteria for deletion. Continued edits are appreciated, but please do not remove this tag. This article will be reviewed at least 1 week after 2010-03-09. Has the site builder ever worked on your powerbook? 2. Make sure you have the newest version of flash installed. Hope 1 of these ideas helps. I personally also can not load my site with Firefox 3.6 (dont know why, facebooks all messed up with it aswell) - you can download an older version of firefox at filehippo. Thanks lee, i tried it on safari first, then downloaded firefox and i didnt work. Also facebooks fine on this firefox.. i can upload images ect all fine. download an older version of firefox, see if that works if it does you know thats the problem - if it doesn't you can think of something else - http://www.filehippo.com/download_fir... > all the older versions are on the right of the page, Try 3.5.6. I have done that, and its still not working! I might have to give up soon. Getting frustrated. Sorry that the other link was broken. Cleared cache. Still the same, wont load. Just does the same as it did before. I think it may be a problem at 'yola's' end, as i just tried on my dads computer and just rang my mate to try and make on and they both said they had the exact same problem! I may need to try another site. 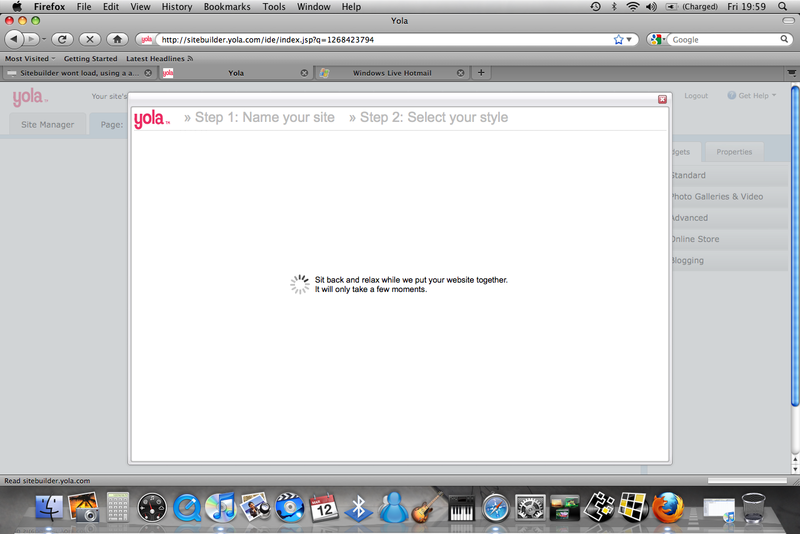 Theres nothing wrong Yola's end - as no one else has the same issues, there is a chance that the page contains some bad custom code which firefox is unable to deal with. When you say above you first try'd it on safari? Did it work? Does it work now in Safari? If you create a new site does that load? No it never worked on safari, and it doesnt work on two versions of firefox (one being the latest version) Thats what im trying to do. Make a new site, i haven't made one before! below are a complete list of to-do s.
3. Disable firefox private browsing. 5. Enable pictures and animations. 7. Check whether you are on a Administrator account. Can you specify in where the progress stops ? If it stops when loading yola , or loading sitebuilder text in the middle of white screen , download flash player (if you didn't) and try again. Try changing your ip (hidemyass.Com) at last. I did steps. 1,2,3,4,5,6 and i dont know how to check if my account is an administrators account. I tried making a completely different account and it says its an invalid email address(I have just made it on hotmail.. and it ends @hotmail.com). To be honest i think yola hates me! I will show you what i mean when its in site builder and its loading. I left it on this screen for hours and nothing happened! Tried about 10-15 times now! That's just bizarre, Sam. I can't offer any suggestions but just wanted to say that I really sympathize with you. I do expect that the Yola staff will find a solution for you. You seem like a person who would really love Yola and would benefit a lot from it. I hope that you'll very soon have the chance to find out how much fun it can be. Yes keara, its all up and running. Im a young photographer and would like to present my work and this will really help me! Fantastic news Sam. Thanks to everyone who participated in this thread and really show some great community spirit!